Facebook isn’t done Snapchat-ifying its properties. Three months after the successful launch of Instagram Stories and following a small test involving a similar feature within Messenger, now WhatsApp is reportedly exploring the idea of adding its own take on the format. The experimental feature, dubbed "Status," adds a new Status tab between Chats and Calls where users can post photo and video updates to share with all or some of their contacts to see. Just like on Snapchat, you can scribble on images or add text and emojis. Users can share multiple updates a day, and each will be viewable for 24 hours. There’s currently no way to manually set a different time limit for how long these statuses are displayed, nor a way to delete them once they've been shared. It’s unclear when or if we’ll see Status roll out to the stable version of WhatsApp. Currently it is available in the newest public beta build of WhatsApp’s Android and iOS clients, but it remains hidden unless your device is rooted or jailbroken. 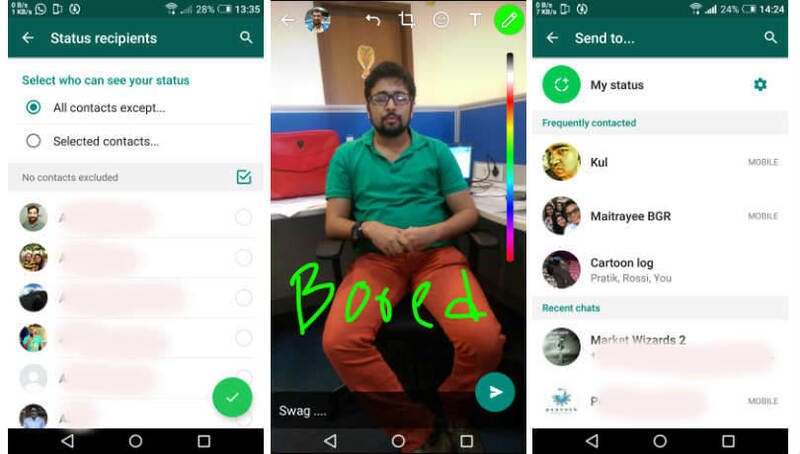 The new Snapchat-like feature does not replace the original Status feature which shows simple text based statuses like “Away”, “Do Not Disturb” or a custom message. This has been available for a while and is still accessible through the settings menu.